There's no doubting that Avatar has been a phenomenal success on Blu-ray, breaking every record in its path, but this success has meant it has earned itself the dubious title of 'the most pirated Blu-ray film ever'. 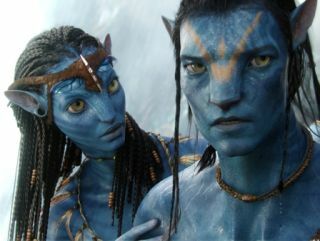 According to TorrentFreak, since Avatar's release BitTorrent sites have been awash with torrents for Avatar, with the film clocking 200,000 downloads in the first four days. This is comparably low when you look at it in relation to DVD piracy, but this may well be down to the massive file sizes Blu-ray needs. And who is to blame for this pirating? Well, it seems that the UK and Australia have been the most prolific. This is being put down to envy, in that the US got hold of Avatar on Blu-ray first, so us Brits decided to download the movie rather than wait for the official UK release date. Twentieth Century Fox won't be too concerned about the piracy. Avatar has already sold more than twice the amount of Blu-rays that The Dark Knight did and it looks likely to be the disc to bring the Blu-ray format to the mainstream. That said, Fox will no doubt be actively looking into ways to stop this sort of piracy from happening again. It does seem pretty straightforward, though – make the release date of a Blu-ray the same the world over.